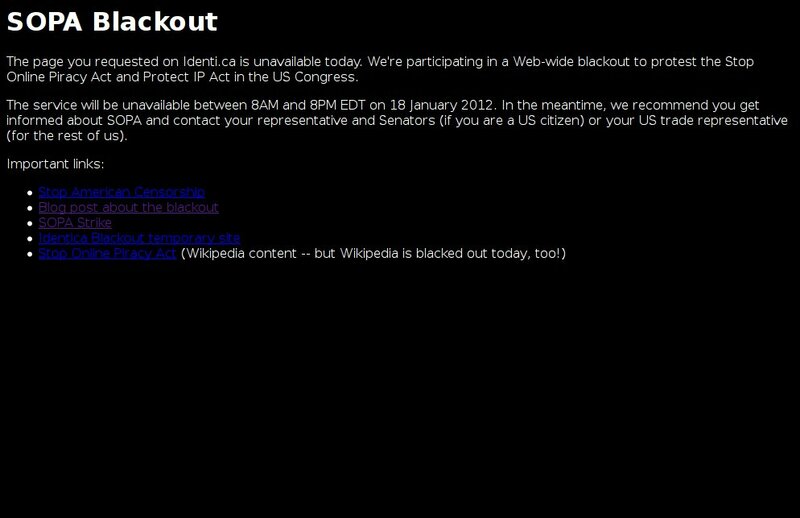 Well, the time has come — January 18, 2012 — and many of the Free/Open Source Software project/advocacy sites, some popular news/discussion sites, as well as our favorite encyclopedia Wikipedia’s English version has gone dark in protest of the pending US Senate and House bills PIPA and SOPA. The Internet blacklist legislation — known as PROTECT IP Act (PIPA) in the Senate and Stop Online Piracy Act (SOPA) in the House — invites Internet security risks, threatens online speech, and hampers Internet innovation. 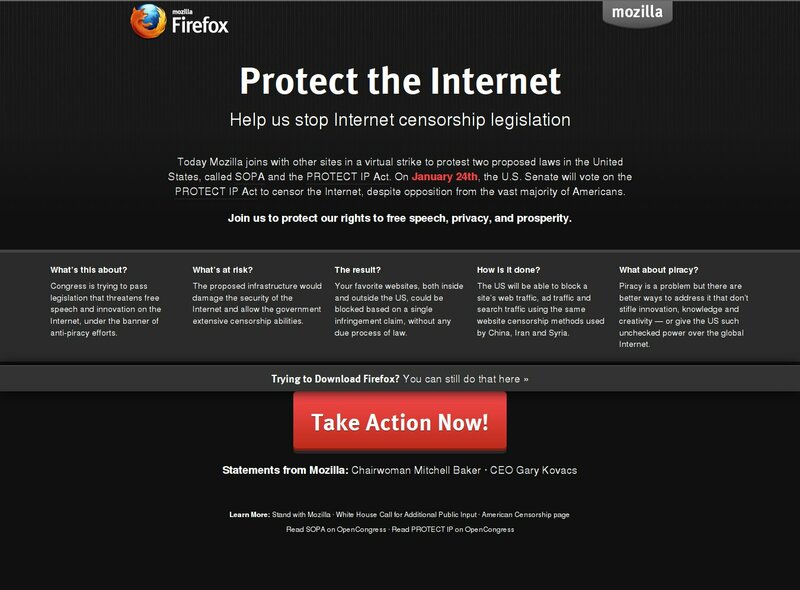 Urge your members of Congress to reject this Internet blacklist campaign in both its forms! To make the most impact right now, we’re asking YOU to do two things. Today, use our handy tool to send an email to your representatives, letting them know you oppose these bills and they should too. Then, on January 23, when the Senate is back in session (and scheduled to vote on PIPA on January 24), call your Senator and tell him or her that it’s time to stand with the Internet and against the Internet blacklists! 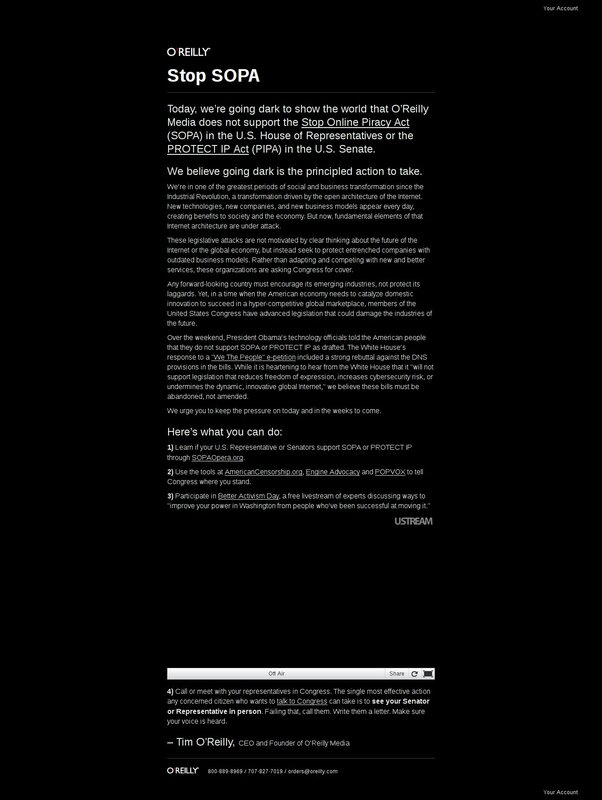 Since LINUX For You is based out of India, unfortunately we can’t write to the US Senators and Representatives in protest. Thus, instead, we thought of documenting how some of the major websites of the world took a stand against the bill — because, if bills like these pass, the dark days of Internet won’t be too far fetched. 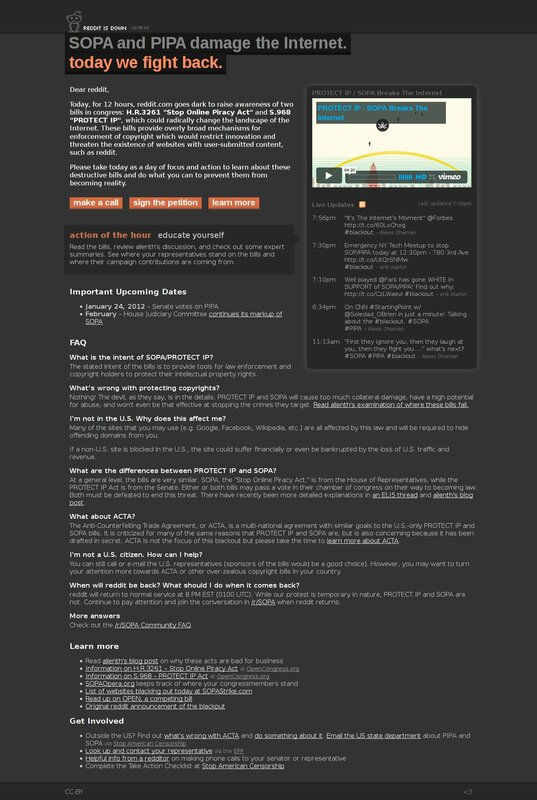 opensourceforu.com uses the WordPress engine for managing it’s content. And it’s heartening to see the project has taken its stand. O’Reilly, one of our favourite publishers, will go dark for 12 hours. And it’s not just oreilly.com, but all of its other web properties too. 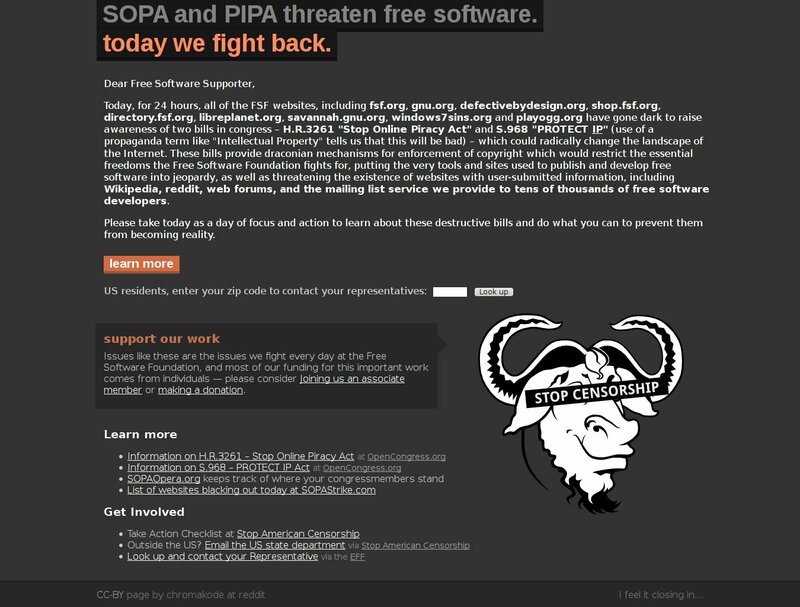 Ironically, bills like SOPA and PIPA claim that they are for the well-being of publishers. Well, the reason for documenting this stand by some of the major websites is to point out that although these bills are US bases, however, if passed they will pose a major threat to the “open Web” as we know it. “Like China, we will block all such websites,” Justice Suresh Kait said while asking counsel for Facebook and Google India to develop a mechanism to keep a check and remove “offensive and objectionable” material from their web pages. And we, like naïves, thought “free speech” was our constitutional right? Wake up, the “BIG BROTHER is watching!” They will refuse to bow down to our “rights”. Well, in the spirit of Free Software, where the word “free” means — not free as in free beer, but free speech — we must stand up for our rights. In the words of great Bob Marley, let us “get up, stand up: stand up for your rights!”, before it’s too late. @madcap_loon I couldn’t see the doodle at my end! Set your browser proxy to a US server. 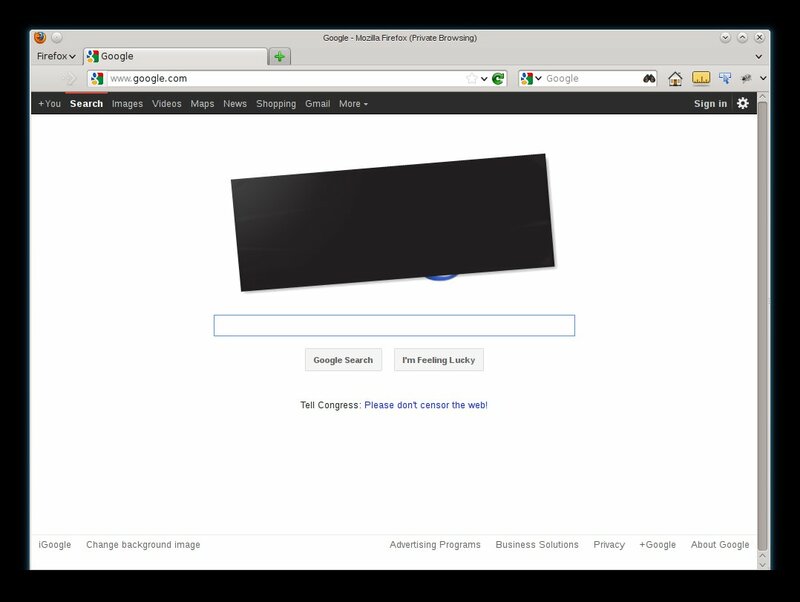 Update to post — google.com censors its logo. Post updated with details on how to visit this version of google.com if you’re from outside the US. What the F-thing is the silly ‘theft of U.S. property’..? SOPA and PImPA. What they got is just some fine sediment of the entire world. No US President or its roots created it all.. they just bombs the ‘rest of the world’ for whatever they want… AFA_TF_IK.